Well known zealot of, advocate, promoter, and official media rep for phony contactee Billy Meier. Disagree with Horn or offer proof showing Meier to be the fraud he is and Horn will blow his stack while demanding an apology. Horn presents himself as a neutral observer and researcher, but has a clear agenda in promoting the Meier case and one not need look far to see that Horn sells Meier DVDs, books, lectures, music, CDs, and anything else he can. Horn likes to promote Meier's 'wedding cake' UFO photos as proof beyond a doubt. It is both painful and just embarrassing to watch someone actually endorse these photos as real. Horn likes to cite the work of other pro-Meier people (Wendell Stevens, Jim Dilettoso, Lee and Brit Elders) when asked for proof. After all, Horn actually believes the Meier case is true because all the pro-Meier literature says so. Someone once referred to Horn as the Pat Robertson of UFOs. For more on fruitcake Horn and his shameless promotion of Meier, see Horn's website and be sure to read his bio where he proudly lists his having invented the fingernail art fad. Now that should qualify anyone to be an investigator! Also see more 'wedding cake' UFO analysis, The Paracast show where the hosts tear Horn to ribbons (See below). ufowatchdog.com has viewed Horn's DVD on the Meier case...don't waste your money - though it does make a great drink coaster. 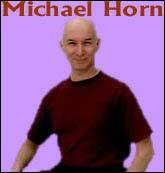 Michael Horn has been a Paracast guest twice! Click on each 'Paracast' logo to the right.